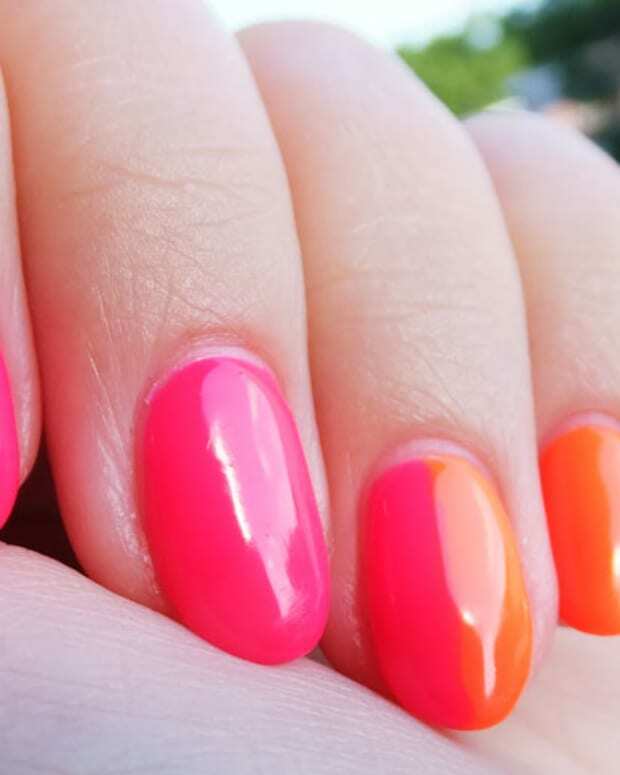 Worried about UV exposure with your soak-off gel manicure? This one is strong and cures in just 30 seconds per coat. Also, hello dot manicure! Dot manicure in Gelish Tiki Tiki Laranga with white craft-paint dots! 1) I&apos;ve not had much luck with soak-off colour on my hands other than OPI Axxium because I need the strong, protective shield Axxium gives me. So why not just use the Axxium base coat with Shellac, or Entity, or Gelish, or any other soak-off colour formulas? Because the different brand chemistries may not play nice with each other. But let me introduce you to a new base coat called Artistic Colour Gloss Soak-Off Building Gel (above right, just behind Gelish Tiki Tiki Laranga). It delivers that Axxium-type strength and flexibility, and works with Gelish, Entity, and Artistic Colour Gloss soak-off colour, which all together offer a huge range of shades. 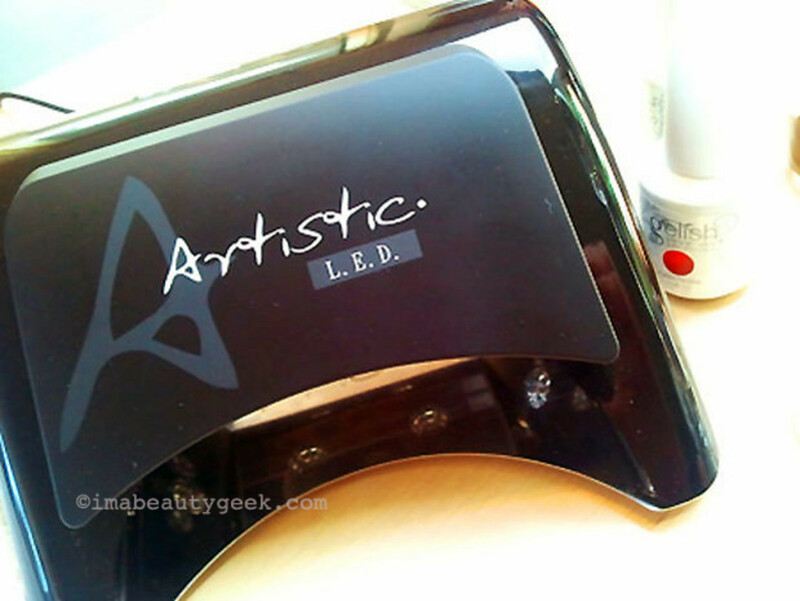 Its sister base coat, Artistic Colour Gloss Bonding Gel, is for naturally strong, ridge-free, non-peel-y nails. Bonus: although I&apos;m not so concerned with nail-lamp UV exposure, I can&apos;t help but like that Artistic Colour Gloss cures in only 30 seconds per coat. Oh, and did I mention that the man behind Artistic Colour Gloss is celeb manicurist Tom Bachik, and Danny Haile, creator of Gelish, consulted on the line? 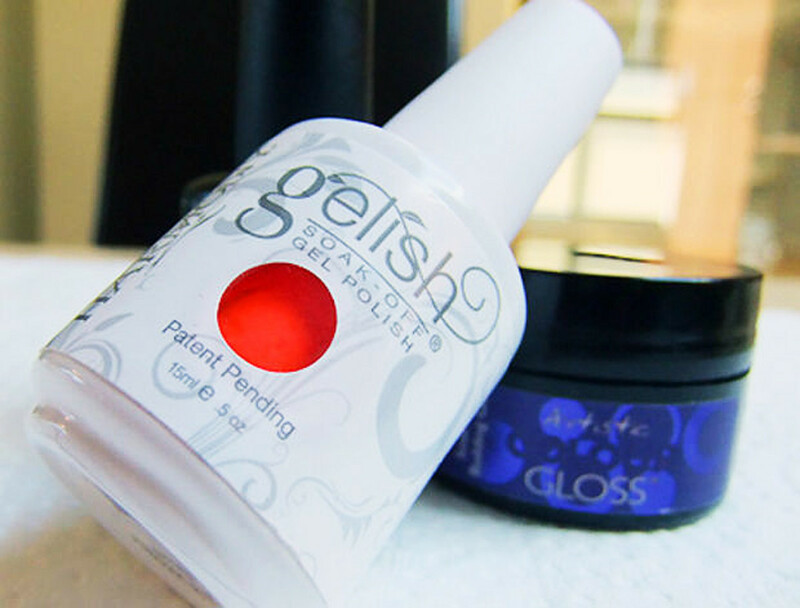 In fact, Gelish and ACG are owned by the same company and share the same technology. Their base, top and prep products can be used with either line. 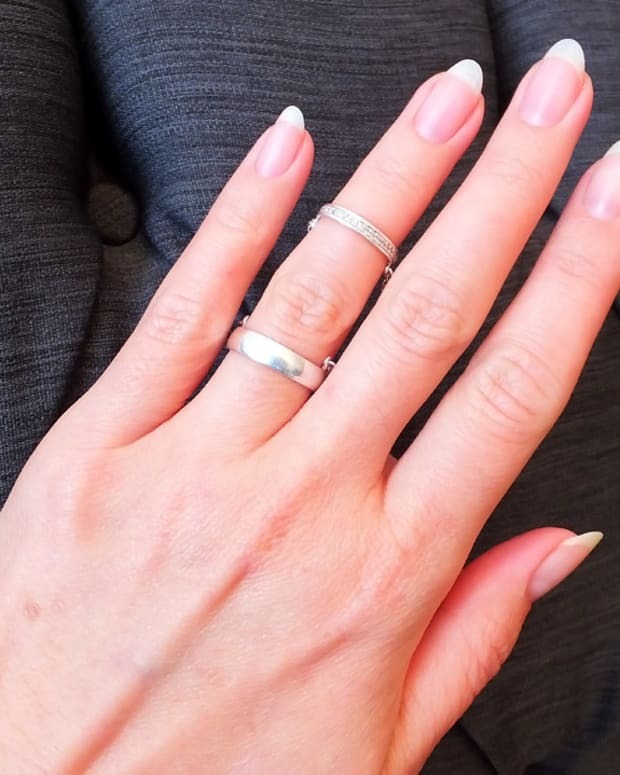 2) If you want less UV exposure during your UV-cured manicures, take note. Meet the new UV LED nail lamp at Tips Nail Bar. This is for use with quick-cure soak-off brands Artistic Colour Gloss, Entity, Gelish, and the coming-this-Fall Gel Color by OPI, all of which are formulated to respond to the specific light wavelengths that UV LED bulbs emit. This particular lamp is designed to cure all your fingers at once; to cure thumb nails, it goes on a stand so you can rest them just under that top shield (it protects your eyes from light emitted via the UV bulbs). 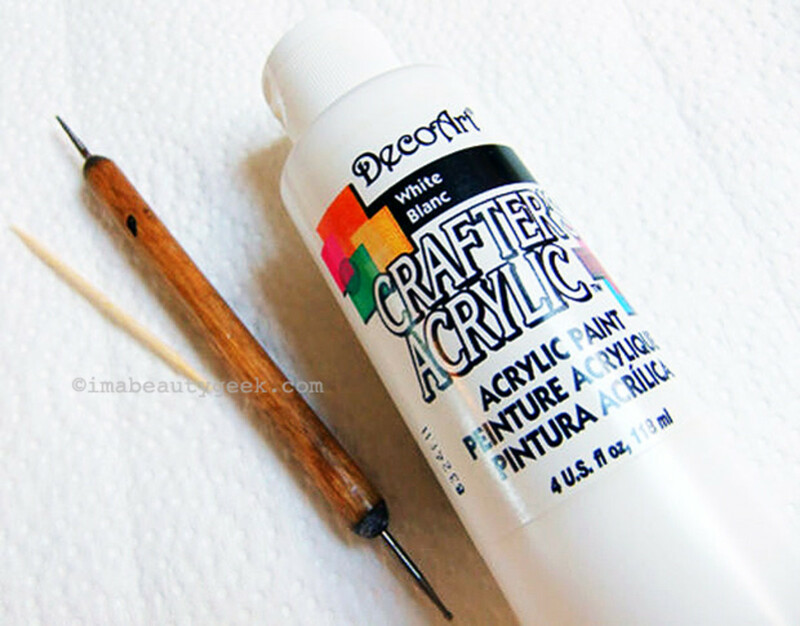 3) And this is the white acrylic paint and dotter art tool Leeanne used to make the tiny dots at the base of my manicure (a toothpick also works as a dotter). It&apos;s easier to get a solid white dot with paint than with white nail polish; after giving the paint a few minutes to dry, Leeanne finished the mani with a clear top-coat polish. The dots and placement were actually Rita Remark&apos;s idea -- thanks lady! Love! Here, another look at my new favourite mani so you don&apos;t have to scroll back up. What do you think? Notice the more oval shape? Photos via Fujifilm FinePix F70EXR digital camera.